(1932, Alessandria, IT) studied philosophy and literature at the University of Turin (Ph.D. 1954, lecturer in aesthetics 1961). 1954–1959 editor for cultural programs RAI, Milan. 1959–1975 non-fiction senior editor, Bompiani publishers, Milan. 1961–1964 lecturer in aesthetics, Faculty of Literature and Philosophy, University of Turin, and at the Faculty of Architecture, Politenico di Milano. 1966–1969 associate professor of visual communication, Faculty of Architecture, University of Florence. 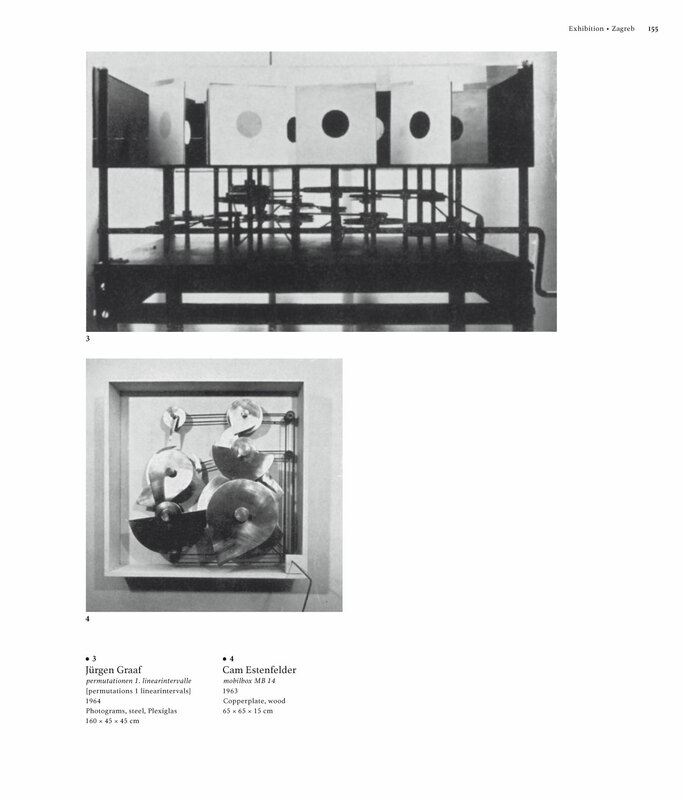 1969–1971 associate professor of semiotics, Faculty of Architecture, Politecnico di Milano. 1969 visiting professor New York University. 1971–1975 associate professor of semiotics, Faculty of Literature and Philosophy, University of Bologna. 1972 visiting professor at Northwestern University, IL, USA. He lives in Milan, IT. Lit. : U. E., “La forma del disordine,” in: Almanacco Letterario Bompiani 1962, Milan, 1961, pp. 175–188. U. E., Opera aperta, Milan, 1962. U. E., “Arte Programmata” in: arte programmata, exhib. cat., Showroom Olivetti, Milan, 1962.
was founded in 1965 by Dieter Hacker, Karl Reinhartz, Helge Sommerrock, and Walter Zehringer in Munich. The group disbanded in 1968. Helge Sommerrock and Walter Zehringer discontinued their work as artists to pursue political activities. Exhib. : 1965, EFFEKT, Deutsches Institut für Film und Fernsehen, Munich. 1965, EFFEKT, Galerie pro, Bad Godesberg. 1969, EFFEKT, Galerie van de Loo– Forum, Munich. was founded in 1957 in Paris by Ángel Duarte, José Duarte, Juan Serrano, Juan Cuenca (joined the group shortly after), and Agustín Ibarrola in Paris. The group disbanded in 1962. Exhib. : 1957, Peintures, Café Le Rond Point, Paris. 1960, Konkrete Kunst. 50 Jahre Entwicklung, Helmhaus, Zurich. 1965, The Responsive Eye, The Museum of Modern Art, New York. 1969, Formas computables, computer center of the University of Madrid. (1924, Trieste, IT – 2009, Trieste) studied book illustration at the Instituto d’Arte di Venezia. He worked as a fine arts school teacher. (1940, Toledo, OH, USA) studied mechanical engineering at the University of Toledo (1959–1963, B.S.) and engineering science at the University of Toledo (1964–1967, M.S.). 1963–1976 worked for the University of Toledo. 1976–2004 worked for the Arizona State University. Since 2004 works for Arizona Board of Regents. He lives in Tempe, AZ, USA. Exhib. : 1967, Computer Art, Stable Gallery, Montreal Museum of Fine Arts. 1968, Cybernetic Serendipity, Institute of Contemporary Arts, London. Lit. : D. E., “Annual Computer Art Contest,” in: Computers and Automation, August 1967, pp. 8–21. (1935, Frankfurt am Main, DE – 1980, Lagos, PT) studied at the Werkkunstschule Offenbach and piano at the Musikhochschule in Frankfurt am Main. 1967 founding member of Com group. was founded in Zagreb, today HR, in 1951. Its name is an abbreviation of Eksperimentalni atelje.” Group members were Bernardo Bernardi, Zdravko Bregovac, Vlado Kristl, Ivan Picelj, Zvonimir Radić, Božidar Rašica, Vjenceslav Richter, Aleksandar Srnec, and Vladimir Zarahović. The group formed at the plenary meeting of the association of applied arts artists of Croatia (ULUPUH) on December 7, 1951. The group disbanded in 1956. Exhib. : 1952, Exat 51, apartment Ivan Picelj, Zagreb. 1952, 7e Salon des Réalités Nouvelles, Paris. 1953, Exat 51, hall of the Architects’ Society of Croatia, Zagreb. Lit. : Jerko Denegri and Želimir Koščević, Exat 51, 1951–56, Zagreb, 1979. Jerko Denegri, Umjetnost konstruktivnog pristupa. Exat 51 i Nove tendencije, Zagreb, 2000.